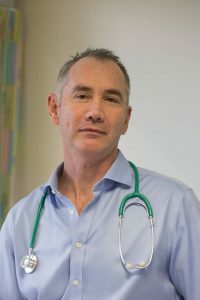 George du Toit is a professor in paediatric allergy at King’s College London and Guy’s and St Thomas’. He obtained his medical degree in 1993 and paediatric specialisation qualifications in 2000. He was senior co-investigator on two National Institutes for Health funded research studies aimed at the prevention of peanut allergy. It was titled the ‘Learning Early about Peanut (LEAP) and LEAP-On Studies’. He is also co-investigator on the LEAP-Trio Studies. George is currently undertaking trials aimed at the treatment of peanut allergy (Palisade and Artemis Trials). He is lead clinician for the children’s drug allergy and urticaria service at St Thomas’. George is past chairperson of the European Academy of Allergy and Clinical Immunology (EAACI) paediatric section. Skin prick tests, specific IgE blood testing, spirometry, nitric oxide, lung function tests and sublingual immunotherapy.